*I’ve never removed a post before. But I couldn’t get away from the creepy feeling the original post was giving me. I have kept much of the original content, but rephrased it so that I’m not speaking as though I were my daughter, which I have no right to do, and am instead speaking as her mother, which I am. My daughter, Emma will be in your class this year. A few days ago, Emma told me she was “scared to go to new school.” Emma loved her teachers and friends from her old school. So I want to introduce you to her. I cannot speak for Emma, I cannot know if everything I write here is completely accurate, but these are things that I have learned over the years, things that are specific to Emma and that may be helpful, at least that is my hope. Sometimes Emma does not look at you when you are speaking to her, but that doesn’t mean she doesn’t hear you. Her hearing is excellent. She may not know how to process what you’ve said or she may not know what is expected of her. Often if you ask Emma a question, especially if it’s a question she knows the answer to she either won’t answer or will say something nonsensical because she isn’t sure what’s expected of her or why the question has been asked. Sometimes people get nervous and don’t know what to say, so they’ll ask, “Oh Emma, that’s a pretty dress. What are you wearing?” or “What color is that?” These are questions that aren’t being asked for any real purpose or they are testing questions. Typically these are the kinds of questions Emma will not answer. Change is difficult for all of us and Emma is no exception. Having a written or picture schedule for the day and week will reduce her anxiety. Like everyone, Emma really appreciates having a say in what happens throughout the day. Whenever appropriate allowing her to set a timer for a one, two or five-minute warning before a change in activity will go a long way in helping her do what she needs to prepare herself. Usually Emma will go along with any change if she’s given sufficient warning. Emma loves people. She is gregarious. Her fall back position is one of happiness. She is also very sensitive. She can tell if someone is upset, stressed or angry and can become easily overwhelmed by those feelings. Emma is terrific at leading others. She can be extremely persuasive and is a great negotiator. Her negotiating skills are wonderful for math and science and her leadership skills are wonderful motivators. Emma loves music, dancing, being on stage in front of an audience. Give Em a microphone and she will sing and dance. She loves “talent shows.” She loves any game involving running, swimming, holding her breath under water, laughing and being silly. She loves playing versions of “Duck, duck, goose” or as Emma would say, “Raincoat, raincoat, umbrella!” Musical chairs is another favorite, dance parties, hide and seek, dressing up, bouncing, swinging and going to any playground. Emma is very athletic and very girly. She likes cooking and while she won’t eat most of what she cooks, unless they’re pancakes, she will enjoy the opportunity to cook. Emma gets upset if she is told not to do something she has just done. Example: “You cannot shout!” after she has just shouted is difficult for her. Obviously she CAN shout, she just did, with you right there watching. Telling her she “can’t” is not true and it’s confusing. Instead say, “You mustn’t shout.” Then in a voice that models what you’d like you can say, “Here is how you can speak instead.” By doing that, you are helping to give her other choices. If she is not allowed to do something, be sure to tell her what she can do as an alternative. Emma resists academics. They are hard for her and she becomes upset when she makes a mistake. She doesn’t like getting anything wrong. But if you help her succeed, she will flourish. If she is reading and doesn’t know a word, give it 15 seconds or so to see if she can work it out on her own, (don’t say “sound it out” or “try again” because she didn’t learn to read phonetically and while she is able to sound some words out on her own, it won’t help her with all those exceptions like limb and thought.) 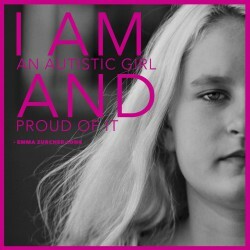 Emma has a strong desire to learn and an even stronger desire to do things independently. With your help, she can and will succeed. Emma gets a look of panic on her face. She may begin breathing with short sharp intakes and she will often talk to herself in a high-pitched questioning voice laced with anxiety. When Emma is overwhelmed she may shut down and withdraw. She may begin scripting, using set phrases she’s heard. Those scripts may be in context with what’s going on or their connection may not be clear to you, but that doesn’t mean there is no connection, it just means you don’t understand or know what it is. Emma often has trouble processing her feelings and the feelings of others. Sometimes she needs help identifying those feelings, just as we all do. Sometimes she will start repeating things other teachers have said to her in the past in a scolding tone, such as, “No Emma! You may not __________. If you ____________ we will take ________________ away!” When Emma is overwhelmed she has to rely on her scripts as all other words have left her. Try to listen even if the words seem meaningless, she is trying to communicate her feelings of distress to you. Sometimes she might say, “You have to ask for help!” This is what she says when she needs help, but sadly this can confuse those who do not know Emma well. She might also say, “Do you want to go swimming?” Which means she really, really wants to go swimming. If you show her on the schedule when she’ll be able to go she will usually calm down. It’s too late, the storm has hit! This is not the time to engage in a power struggle. Emma is not trying to manipulate you or upset anyone. She is simply expressing her frustration in the only way she knows to. Sometimes if she’s very upset she will bite herself or punch herself, usually on the hand or arm, sometimes if things are very bad, she will punch herself in the face. Do not exacerbate this challenging time by raising your voice or telling her “You cannot hit!” or “You cannot bite!” or even “We don’t bite.” (See Does not like paragraph above) Restraining her in an attempt to stop her will not prove helpful either. Emma bites or hits herself because the feelings of frustration are overwhelming her. The pain she causes herself by biting or hitting is within her control and is therefore preferable. It things have escalated to the point where Emma is hurting herself, everyone must try to understand what has happened before things became this derailed and try to prevent them. Sometimes it isn’t possible, but Emma is trying to cope as best she can. When she is calmer you can work on helping her find alternate ways to cope. What helps you when you feel overwhelmed? What things do you do when you feel anxious, scared or upset and no longer feel you’re able to function? Maybe the things that work for you will help Emma too. Remember, be patient. Showing Emma once or twice will not mean she’s learned, she will likely need to be shown numerous times. Often there is a sensorial component to her upset. She is overwhelmed with feelings or a sensation or too many sensations. She may be tired or hungry, too hot, cold or thirsty. Sometimes a sensory break will do wonders to restore her equilibrium. Make it into a game! Music can be incorporated into just about any activity and can change anything. High affect and silliness can make something that feels difficult seem fun! Emma loves anything silly and ridiculous. Silly faces, silly dances, playful interactions, games! She has specific jokes she likes to play with specific people. Emma loves to laugh. She loves to make up word games. She enjoys taking a word like “uncle” and changing it to “Jungle.” She will happily tell you that she has a “Jungle Andy and a Jungle Victor.” Come up with silly word games and Emma will join in with glee. Things that have a tendency to backfire? If you say, “You have to do ________________. If you don’t, I’m going to take __________________ away” will make her upset and anxious. She will have a hard time concentrating because she will worry about having something she wants taken from her. Instead say, “You can ______________, but first you need to __________________.” That way Emma can concentrate on having/doing something she loves as opposed to taking something away. Emma has a string that she loves. Please do not take away her string or use it as a form of punishment. Her string helps her focus and it makes her feel safe. If you take it away or threaten to she will become completely overwhelmed. Sometimes, when she is writing or typing and needs both hands to do so, you can ask her to set her string near her or in her lap. If you allow her to control where she puts her string she will feel safe enough to concentrate and do her work. Also (a little secret) if you get some string or ribbon and copy her movements in a playful way, you might see and feel for yourself how wonderful it can be and Emma will be delighted that someone wanted to interact with her in a way that she loves. Emma does not have any allergies or foods she cannot eat. However she likes to eat the same food everyday. Some food looks, tastes and smells strange to Emma. Please do not make her eat anything she isn’t interested in eating. Please do not tell her she must finish something in order to have something else. If Emma shows interest in something someone else has or is eating and it’s appropriate, do allow her to smell, lick, taste or eat it if she wants to. And please do tell me so that I can find whatever it is and offer it to her at home too. We will pack Emma’s lunch everyday. Assume competence and respect Emma’s process. Emma can and does learn. She may take longer or less time than another child, but she will learn. She is extremely independent. Show her, help her, let her. You are her role model. Emma has dreams, just as we all do. You can help her achieve those dreams by believing in her. I am available to talk, discuss and strategize. I am here to help in any way that I can. Nothing is more important to me than my daughter. Please keep in touch with me. Please let me help in any way that I can. There is no detail about Emma’s day that is too small. Do not hesitate in emailing me _____________ or calling _____________. This entry was posted in Autism, Education, Parenting and tagged American Museum of Natural History, Autism, echololia, Education, role model, Self Injurious Behavior, sensory issues, Stimming, Student, Teacher. Bookmark the permalink. Maybe we should all have a letter like this that we write for all who come into contact with us! My hope is that one day Emma will write her own letter!! oooh, I love the idea that we could all have letters like this for people to understand us better! Would be so helpful. This is a great way to let the teacher in on your daughters’ world. It addresses behaviors & what works for Emma. Which, will be a big help, for her teacher. I especially liked how Emma explained what not to do, during a stressful situation. I’m going to use that technique with my asd, daughter. ( do not threaten to take her favorite playtime/toy away) but-tell her to do (this), then she gets to do (that/special activity). So simple, yet, I’ve been doing it wrong, lately. I’ve been saying, “if you don’t do ____ now, I’m taking away your iPad privileges.” ect.. Btw- it hasn’t been working out too good, lately. So, I’ll try to remember what works more effectively..
I’m just learning this stuff too Andrea and need constant reminding. Thanks for reaching out! Is Emma in a regular, mainstreamed classroom with an aide? Or is she in a special ed classroom? Em is in a special ed classroom with 5 other children all on the spectrum. That sounds like Risa’s classroom, too. Is she the only girl? This is a public school vs the private one she was in, correct? Hi Angie, Emma is one of two girls in a class of 6 children. Her new school is a public school. I need a T-shirt that says this: “Assume competence and respect my process.” Or maybe a tattoo! What an amazing phrase. I’m going to write it on my whiteboard behind my monitor so I can look at throughout the day and smile at its simplicity and wisdom. You’ve written a wonderful letter and I hope Emma’s teacher(s) will take it to heart and use it as a guide. In fact, a lot of what you’ve written is good advice for dealing with children regardless of whether or not they are on the spectrum. That means a lot to me, thank you for this. Ariane- what a wonderful post about helping your child- and all children- in a caring, empowering and effective way. Thank you R. Really appreciate it. Beautiful and a true way for a teacher to connect with E from day one. I hope they read it with heart and re read it often. Thanks Barbara. I hope so too! Love the letter, love you, love Emma. I will be with both of you tomorrow in spirit, thinking of you, sending good vibes across the miles that separate us, meditating on both of you.. Thank you Mom. We are feeling very optimistic. I think her new school will prove to be a good fit for her. I am sharing this to my FB wall in part so that my friends can read and be inspired by it as I was, but largely so I can “bookmark” it and use it myself when the time comes. Thinking of you two tomorrow. Next year, we will be moving, and I worry. The Boy does so well in his current school, and I can only hope that there will be a fantastic teacher waiting for us in our new school. A letter like this would not only help The Boy and the new teacher, but it would go a long way toward calming my fears, I think. Thanks for sharing! Good luck with the move, that’s nerve wracking for everyone! I think I’ve been as nervous, if not more nervous than Emma about her new school. But Richard and I met with her teachers today, and they were uniformly lovely. Time will tell, of course, but it made me very hopeful. I think Emma would be awesome fun. If I were a teacher, I’d like her. I would really LOVE it if you were her teacher!! Becky, so pleased to hear Brett is doing well! This could be my daughter. Finally a blog I can relate to. First day this year the new teacher sent home a page asking the parents to let her know all about the child. I filled the page front and back all the while hoping i wasn’t coming across as obnoxious 🙂 I felt I had to speak for her (as best as I could) because I know she can’t explain her ways. LOL! Yup, that’s me, carefully filling out each question, making notes in the margins. I thought – oh they’re going to think I’m one of “those” moms. But a couple of friends of mine who are teachers told me that most really good teachers will understand that we’re just trying to look out for our child. I was so relieved when her teachers were not only kind about my FIVE page letter, but really grateful for it. Pingback: Sunday Shout-Out: My New-ish Community | Simple. I Just Do. Despite our meetings and discussions, I am having trouble with Tyoma’s teacher. I am going to use this as a roadmap to Tyoma’s teacher. I had read this at the beginning of the school year when things were going well. Now with fall and winter flus swishing around, I have to remind and re-educate. You have given me the perfect road map. I am so grateful to have the help. I would feel so lost tonight without your post! Oh Lori, I’m wishing you good, good luck with your meeting. I was very worried about this letter, it was long, I worried they’d see it as condescending or trying to tell them how to do their job, I worried they would think I was a controlling Mom, over protective, blah, blah, blah… We’ve been very, very lucky, Emma’s teacher has not only been incredibly kind and grateful for my input, including this letter, but she is actively working with me to brain storm new ways to engage Em. She even went to my friend Ibby’s blog and read Ibby’s suggestions on how I might help Emma enjoy her reading assignments more. Now we’re discussing writing scripts that Emma can act out! What an amazing difference good teachers make for everyone! I’m so glad you thought this might be helpful. Tell me how it goes. I think this is a wonderful letter and you are a wonderful mother! I am a 50-year-old autistic woman, diagnosed 4 years ago. This letter is similar to the letter of disclosure and request for accommodations I wrote to my boss before I accepted my current job, almost one year ago. I searched for models for the letter but found none, so I wrote it from scratch and edited it slightly, based on feedback from friends, both autistic and non-autistic. I wish I could point you to a site where I could post the entire letter, but I don’t have a blog. I just discovered *your* blog, by the way, and I find it…well, thrilling is the word that comes first to mind! It is so exciting, refreshing, empowering to read the words of a mother who embraces the insights of autistic adults and who sees her daughter as a…”real” and whole child not a stolen, tragic, broken one. Anyway, thank you again for your blog. Your voice is an important one! I will be reading regularly from now on. Hugs and kisses to you! Rina, thank you so much for reaching out and yes, I would LOVE to read your letter in full. You can send it to emmashopeblog@gmail.com and I will see it. I have met and continue to meet wonderful people through this blog. I feel incredibly fortunate. It’s just wonderful to hear from you and meet you! I just sent you an email with the letter. Thank you for your interest! Ok this letter could have been written by me about my son! Minus the string…WOW-amazing. In particular the last part about no bit of info being to small & him being THE most important thing in my life. Emma’s Hope Book is describing our journey. The parallel is uncanny. It is truly amazing to look back at this “letter” which I gave to her teachers, but I couldn’t have known how wrong I was about so many things. If you read any of the more recent posts on this blog you will understand why I say this! I’d forgotten about this post until you commented on it just now! Whew! How incredibly things have changed since this was written!! Good to know. I have never communicated this way before. I don’t even do FB! So I will have to pay more attn to dates etc when I read posts. I guess that speaks to the power of your story and your site. You even got ME, Ms. Low-Tech, posting comments. 🙂 It also speaks to our lifestyle that we must have flexibility in our thinking and be willing & open to how things are, not how we THINK they are or how we think they should be. It reminds me of this quote. “It ain’t what you don’t know that gets you into trouble. PS Just so you know, since writing that letter we’ve learned that our daughter could read and has been reading since she was two. Since writing that letter, we’ve learned that she not only knows addition and subtraction, but also multiplication and division, despite having never been formally “taught” any of it. Since writing that letter, we’ve learned that she is well aware of time, has a firm grasp on the value of all American coins and bills as well as has many thoughts, opinions and ideas about all the things people say about her in front of her or when she’s within hearing distance while assuming she couldn’t and didn’t understand. Much to our shock, Emma is now telling us things we didn’t understand, didn’t know and didn’t assume. It’s funny to read that I wrote, “Assume competence” because I really thought I was and yet, it is now clear that I hadn’t gone nearly far enough in doing so. Sorry to throw a link at you, but keep commenting and I promise I’ll keep responding. You’re right to believe in your boy. Above all else presume competence, you cannot go wrong and will do no damage, but to not presume competence and to be wrong, most certainly will. PS Almost everything we were told has proven incorrect and almost everyone underestimated her! Yes! Finally, someone other than me is seeing what’s so wrong about a parent writing in their child’s voice! It bugs me so much when I see that, and so many parents see absolutely no problem with doing this.